Saturday was a very unusual day for us. Normally Michael has to work on the weekends especially when it is sunny. But this Saturday he only had to work in the evening and so we did something we hardly ever do: we went shopping. I’m usually not a big fan of weekend shopping. 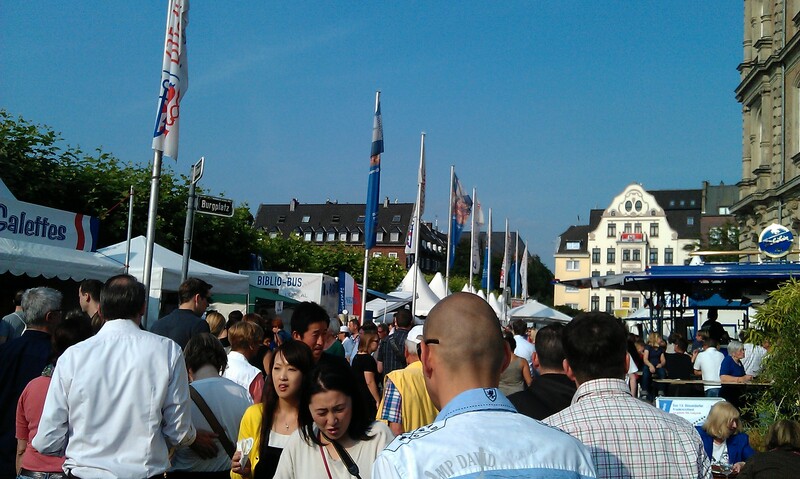 The city center is packed with people but this Saturday it was fun. We didn’t need anything so when a shop was packed and you would have to cue to try something on we just didn’t. In the end we ended up near the Rhine having a glass of Uerige, one of Dusseldorf’s Altbiers, a special brew of beer. The Uerige brewery is situated close to the Rhine and an institution. The street infront of it (it is part of the city center and therefore pedestrian area) is always packed, summer or winter. Waiters are walking around, carrying huge tablets full of small beer glasses and you just stop there, maybe meet some friends, have a beer and then move on. I think this is one of the most Dusseldorfian places. But this weekend offered some more entertainment. 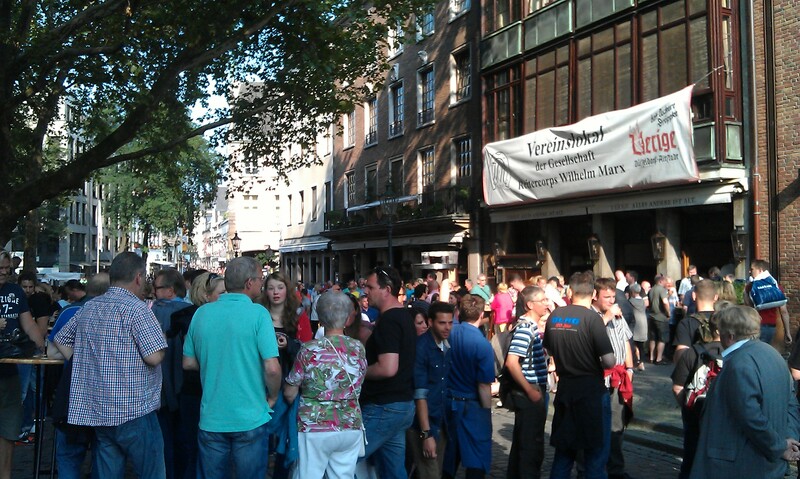 I had already spent a lovely friday night on the Rhine boulevard on the Frankreichfest. The “French Festival” takes place every summer for a weekend and in lots of pavilions French producers offer their products that you can consume directly there on tables and benches infront of the pavilions. You might want to bring your own knife though as you mostly get whole pieces of cheese or sausages but no cutlery. Only wine glasses are no problem. You can get them for a small deposit from the wine sellers when you buy a bottle of wine. And then for this week it is “Kirmes”. The Kirmes is Dusseldorf’s summer fair and at the same time the Schützenfest for the whole city after many neighborhoods have had their small Schützenfests already. This involves parades through town and a fair ground with all the usual stuff from roller coasters to the biggest merry-go-rounds. I’m not the biggest fan of that even though I enjoyed it immensely as a child. But the cool thing about Dusseldorf’s fair ground is that it is on the Rhine meadows on the opposite side of the Rhine from the city center. Of course you could cross the bridge and walk there but that would be quite a long way. So, only to this occasion there is a ferry, the so called Kirmesfähre, which shuttles people from the city center to the fair ground and back. So cool! I guess I might just go to the Kirmes to take the ferry. This entry was posted in Germany and tagged Dusseldorf, Event, Summer by kathatravelling. Bookmark the permalink. I love the twilight fair pic! I was in Germany, briefly, but don’t remember too much as I was drunk the whole time! I must add I was maybe all of 20 years old and in love with the novel idea that you didn’t have to be 21 to drink in this country to drink in this country – yea! No, it was a good time. Met great people. I would like to go again and not be working…or drunk! Oh don’t worry, the thing with the drinking happens to many people here, even the Germans 😉 But definitively come back. I learned to appreciate all the things Germany has to offer when I was away, so much to see, do and eat here.